Home Tally.ERP 9 Upgrade How to upgrade Tally ERP9? How to upgrade Tally ERP9? Tally ERP9 is a regularly updating business software aiming for product enhancement to simplify the business management and to increase better user experience.How to upgrade Tally ERP9? Does Tally ERP9 have the facility of upgrading?.Earlier versions of Tally ERP9 Does not have the facility of upgrading software, other than un installing older one and Installing latest version.But in latest Tally ERP9 have the facility of upgrading without un installing older version. In this guide you can learn How to upgrade Tally ERP9. The most important feature is that, up gradation will not affect the existing companies data. To upgrade, You must have an Internet connections to download files .Before going for any change in Tally ERP9 Software, it is highly recommend for a data backup. Lets begin the up-gradation process. Open Tally Software folder, Usually Tally Installs at C:\Program Files\Tally.ERP9, If you have changed Tally software folder at the time of Installation, and you don’t know where it is exactly, follow the instruction. Right click on the Tally Icon from you desktop. Click on Properties. Tally properties windows will appear. In the properties,you will find a button ‘Open File Location’. Click on Open File Location. Tally ERP9 Software folder will open. Inside Tally ERP9 Software folder there is a setup.exe file, double click on it. 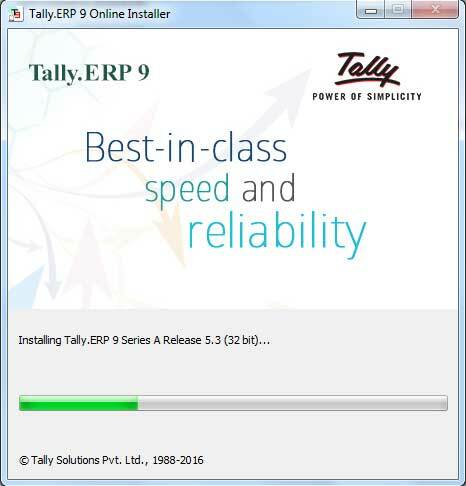 Tally ERP9 Installer wizard open. In the Upgrade wizard There is a button called Upgrade,click on it. In the New set-up wizard you can find the old version and Latest available version details. By clicking on the Latest version detail link, takes you to the Tallysolutions website where you can read what is new in this release. Now click on Install button. The set-up will begins to download new version of Tally ERP9. Up on completion of downloading The set-up will Install the software automatically. After successful installation you will get a confirmation message. Click on Done , The new version of Tally ERP9 will open. How to upgrade to Tally.ERP 9 Release 5 in Multi-User Environment?